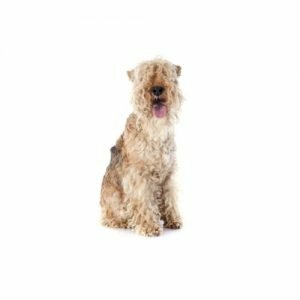 The Lakeland Terrier has a dense, wiry coat with longer hair on the legs and muzzle, often giving him a distinct beard. Small, sturdy and workmanlike, the breed?۪s narrow frame allows him to squeeze into rocky dens to chase after vermin. While generally a show dog or family companion today, Lakelands can also be found utilizing their natural instincts at earthdog events or digging in the backyard. The breed comes in a variety of colors including blue, black, liver, red and wheaten with or without a patch of color over the back and shoulders called a “saddle”. The Lakeland is bold, friendly and confident but has a quiet disposition. While he is well suited for a variety of living situations including rural and urban settings, the Lakeland?۪s energy level makes him well suited for an active lifestyle. His coat shed minimally but requires periodic clipping by a groomer. Ideal size approximately 14?_ inches tall at the shoulder and 17 pounds.